JDO: Darryl Hart’s chapter is fairly technical, tracing the change from exclusive psalmody to mixed psalms and hymns in Presbyterian churches. He focuses heavily on two hymn-writers, Isaac Watts and Charles Wesley, and shows that their hymns were a major influence in the change in Presbyterian, and by extension our own Dutch Reformed, tradition. Our own blue Psalter Hymnal includes eight selections by Charles Wesley and seven by Isaac Watts, which is substantive proof that this is a conversation not just for Presbyterians, but for us in the URCNA. MRK: Hart begins with the question, “What is the appropriate psalm to sing for a Christmas Eve service?” This question drives right to the center of the conflict in Reformed worship. Churches that sing the Psalter usually don’t observe the liturgical calendar. Churches that observe the liturgical calendar don’t usually sing the Psalms. Hart uses this thought-provoking example to make the case that “Reformed worship has traditionally been a tapestry of mutually reinforcing convictions and practices” (p. 61). JDO: What Hart is getting at, and what he unpacks in the rest of the chapter, is that our worship styles and our systems of doctrine must be linked in order to make sense. This isn’t necessarily a judgment on exclusive psalmody or Christian holidays, but Hart’s main point rings true: If you’re going to be biblically-based in one area, carry it through. And so Hart begins the discussion, as any discussion of worship should begin, with the regulative principle of worship. He says, “The gravity of worship and the fear of blasphemy made Presbyterians cautious about all elements of worship” (p. 63). This idea is consistent with Presbyterian and Continental Reformed doctrine, and is echoed in our own Heidelberg Catechism (Q&A 96). MRK: Hart describes two different philosophies of worship music during the Reformation. One view was held by Ulrich Zwingli and Heinrich Bullinger, who outright forbade music in the church because of its “destructive power” and because they found no scriptural warrant for it. JDO: That might strike us as outrageous, but you have to realize the context in which they lived. Music was associated with the inaccessible and overly complicated mass, sung exclusively by trained choirs in a language and style that was not understandable by the congregation. In addition, Zwingli and Bullinger realized the truth behind the old adage, “Heretics sing hymns.” The singing of hymns was commonly practiced by heretics in the early church as a method of teaching false doctrine to the common folk. The singing of non-biblical hymns was associated with false doctrine, and hence would be too dangerous to risk. In a period where hymnody was oft-misused, it would be easy for them, in their desire for restructure and reformation, to toss out the baby with the bathwater. While I don’t agree with their conclusions, I can at least respect their reasoning. MRK: Calvin, however, seems to have reached a better (and more Biblical) balance. As Hart puts it, “Believers should really sing, both with voice and heart” (p. 64). JDO: Yes. Calvin (like Augustine before him) understood congregational singing to be a form of corporate prayer, an easy way to facilitate corporate praying. His solution to the problem of heretical hymnody was to look to the psalms as a source for music—which makes sense, because the Reformation’s return to the Bible should naturally be accompanied by a return to Biblical music. Like Hart said, doctrine and practice and worship all should logically fit together. MRK: While Calvin’s general pattern of worship continued for centuries in the Reformed and Presbyterian tradition, exclusive psalmody as the hallmark of Reformed worship did not last long. In America hymns were first introduced in 1729, in the form of a songbook published by Benjamin Franklin. Its title: The Psalms of David Imitated by Isaac Watts. JDO: I have that book sitting right in front of me now. And looking through it, it’s easy to see how hymns subtly infiltrated worship. MRK: With a name as innocent-sounding as The Psalms of David Imitated, what was so revolutionary about Watts’s work? And why is he widely credited (for good or no) with the introduction of extra-Biblical hymns into worship? MRK: Yes—Psalms 72 (“Jesus Shall Reign”) and 90 (“O God, Our Help in Ages Past”) probably exemplify some of Watts’s most dramatic alterations to the Biblical texts. For the record, both are in our Psalter Hymnal. JDO: So you can see that as songs like these easily began to sneak into psalters, the door opened to including hymns not even remotely inspired by the psalms. Now as I said last week, I have a love-hate relationship with Watts. His work is commendable. Recognizing the continuing value of the Old Testament, he brought out its relevance and Christ-centered significance. But the effect of his psalm-hymns on the psalm-singing tradition is regrettable. MRK: Now that brings me to a more immanent matter. In the forthcoming URC/OPC Psalter Hymnal, should paraphrases like “O God, Our Help in Ages Past” be kept in the psalm section, or should they be moved to the hymn section? Or, if they detract from true psalm-singing, should they be omitted entirely? JDO: I’ve thought about that a bit, but every answer I come up with is overly complicated. Most of these psalm paraphrases are still good and biblically helpful to sing, but they can’t in all fairnes be called psalm settings. What if we marked “looser” psalm settings as 72-HYMN, for example, or printed them in a different color? Or what if we stuck a psalm-hymn cyborg area between the existing psalm and hymn sections? MRK: Right. Presenting the Psalter Psalm-Hymn Hymnal. Seriously, though, I’m sure there are many ways to approach the problem, and I’m sure it will be handled wisely by the Songbook Committee. But I think the take-home message would be that we need to prioritize good, literal psalm settings, even if they’re not as familiar as some of these paraphrases. If we have a good base of psalmody in our worship, hymns and “imitations” like the work of Isaac Watts will fall into their proper place. JDO: Now in Watts’s wake, hymns from many different perspectives began to creep into the repertoires of the Church. Among them were the works of Charles Wesley. MRK: And whatever Wesley may have been, he was certainly prolific—writing over 6000 hymns, compared to Watts’s 700. JDO: But now we return to what we’ve mentioned before: the importance of matching practice with theology. Hart points out that for Presbyterian and (by extension) Reformed churches to sing Wesleyan hymns is “a theological and liturgical oddity that has not generated sufficient comment” (p. 71). Seriously, hasn’t this ever struck anyone as odd before? MRK: Perhaps it’s just something we don’t think about too often. Many people, including me, couldn’t tell you who wrote “Hark! the Herald Angels Sing” off the top of their head. We tend to accept familiar hymns as familiar, without giving any thought to their authors—and that’s a very detrimental oversight, in my humble opinion. While we don’t want this to become an exposé of Charles Wesley, we do have to admit that his beliefs were not in line with orthodox Reformed theology. JDO: Yes. Hart describes the combination of Presbyterian doctrine and Wesleyan piety as an “unstable compound” (p. 72). As we’ve pointed out before, what you sing affects what (and how) you think—and the easiest way to spread change (good or bad) is to get people to sing it. JDO: That’s completely backwards. Paul’s injunctions to sing are to the end of glorifying God, “making melody in your heart to the Lord.” The Psalms speak the same way. Songs are not meant to draw people in, like some third key of the Kingdom. While the Holy Spirit is entirely free and able to use a variety of means, the preaching of the gospel is his modus operandi (Romans 10:14-17). So to purposely create songs to function as means of salvation seems to go against the Scripture’s very basis for singing. MRK: Not only are Wesleyan hymns “me-focused,” but they’re often so individualistic that they simply can’t apply to the whole body of Christ. The alarming part is that, as Hart says, “Presbyterians in America had no intrinsic objections of principle to the evangelistic purposes or experiential piety involved in Wesley’s hymns” (p. 73). Their songs became inconsistent with their doctrine, and they didn’t seem to mind one bit. JDO: I do want to point out that not all Wesleyan hymns are, well, blatantly Wesleyan. For instance, I love “And Can it Be” and “Christ the Lord is Risen Today.” I think these songs are appropriate and beneficial for corporate worship. MRK: Yes—one should be careful, Zwingli in mind, not to throw the hymnological baby out with the bathwater. JDO: But I guess the lesson to learn is that we mustn’t be afraid to question the hymns we sing. It’s so easy just to let songs slip into our worship without thinking about their implications. Take, for instance, Wesley’s “Jesus, Lover of My Soul.” I hope I don’t get into trouble here, but notice how the words are so personal, so autobiographical, so specific to me. I’m not necessarily saying that we need to throw that song out of the Psalter Hymnal, but I would definitely recommend caution. Let’s always make sure to balance songs like that with songs that focus on God and His glory. For every “Jesus, Lover of My Soul,” it’d be wise to sing a decent handful of “Praise to the Lord, the Almighty”s. MRK: And, of course, a bunch of psalms. JDO: Absolutely. With the psalms, you’re guaranteed to get the balance right. They are, after all, inspired. And even when the psalms sing of personal experience, it’s to the end of glorifying God. MRK: Back in Sing a New Song, Hart mentions one other extremely influential hymn writer: Horatius Bonar (1808-1889), who’s been called “the greatest of Scottish hymnwriters” (p. 74). Bonar’s four selections in the Psalter Hymnal are “O Love of God, How Strong and True” (329), “Not What My Hands Have Done” (389), “I Heard the Voice of Jesus Say” (413), and “Fill Thou My Life” (449). Now I do love many of Bonar’s hymns, including “Not What My Hands Have Done” and “Fill Thou My Life.” But the same Wesleyan emphasis on personal experience can be traced through many of Bonar’s works. JDO: There’s no doubt that our churches today are still reeling from the effects of experience-based, me-focused, results-oriented forms of Christianity. And those ways of thinking creep in through music. Catchy, memorable, beautiful songs are the quickest way to spread ideas. That’s precisely why we at URC Psalmody, like Hart, are so passionate about a return to psalm-singing (if not exclusively, at least primarily). More importantly, we need to love the psalms. Wouldn’t it be great if a love for the psalms could spread in the same way as a love for Wesley’s experiential hymnody? MRK: After his detailed hymnological study, Hart spends the last three pages of his chapter reflecting on the importance of psalm-singing. Again and again he brings out the need for Presbyterian and Reformed Christians “to be discerning about the common idiom of American culture” (p. 76). Presbyterians and Reformed Protestants may have a valuable remedy for resisting the novelty, emotional excess, and disorder that characterizes so much worship in the contemporary church—a return to the Psalter. It is certainly not a magic cure-all that will suddenly cause teenagers to be attentive and put an end to worship committees’ desire to experiment with new forms of worship. But…if Presbyterians are jealous for singing the right songs in worship, debates over the regulative principle, questions about spontaneity, and worries about bored children and confused visitors may actually fall into their proper place. This declaration is one of the most humble and yet one of the most inspiring statements in all of Scripture. With simple earnestness it admonishes each of us to trust in the LORD with all our hearts. And the entirety of Psalm 115, like this opening verse, revolves around the same theme: total reliance on God. The rest of Psalm 115 (vv. 12-18) focuses on God’s blessings on his people and their response of praise. Today, as is our custom, we’ll consider the two versifications of Psalm 115 found in the blue Psalter Hymnal. The most significant drawback of number 226 is that it is an extremely condensed version of Psalm 115—a light summary rather than a full psalm setting. The list of idols’ flaws in Psalm 115:4-8 is not completely represented in this setting, and vv. 9-13 are unapologetically smashed into a single stanza, with significant chunks of the original text missing entirely. The melody of number 226 is a fine one. From what I can tell, GAIRNEY BRIDGE was composed by Ernest Kroeger in 1901 for the United Presbyterian Board of Publication—the creators of the 1912 Psalter. Thus, it has the unique characteristic of being specifically tailored for this psalm setting. Two accusations that could be legitimately leveled at the tune are its high key (it could be reasonably re-set in D-flat or D) and its unusual chromaticism (especially in mm. 6 and 8-10). Personally, I haven’t found that these flaws significantly impede congregational singing, so I wouldn’t be quick to suggest a tune change. If both of these aspects are concerns at your church, however, you might consider the different harmonization and lower key of gray Psalter Hymnal number 115. In conclusion, number 226 is a fine song. However, I think it is best utilized as a psalm-hymn rather than a strict versification. I’d be content with this as a secondary psalm setting in the URC Psalter Hymnal, but I would also be very interested to see if a more accurate version might be used in its place. “The Lord Who Has Remembered Us” is merely an excerpt from Psalm 115, but it’s not a bad selection. The chief merit of number 227 is that it provides a complete and accurate versification of Psalm 115:12-18 rather than skimming over key points. The tune, ST. ANNE, is very appropriate since it is often associated with “O God, Our Help in Ages Past.” I am happy to see it here in a time signature of 4/2 rather than 4/4, since this meter lends itself to a fittingly meditative chorale rather than a bumpy common-time melody (as it is too often played). Thankfully, no tune change is necessary here! Although I can claim nearly every psalm in the Bible as my favorite, Psalm 115 stands out from the rest for its simple honesty and humble expressions of praise. This passage provides a much-needed perspective adjustment for all of us as we sojourn in this idolatrous world yet follow our heavenly Father. Over the past few weeks, we’ve been considering the issue of psalm paraphrases. We’ve looked at the definition of “psalm-hymns” and their use in worship. Last week, I pointed out how singing psalm-hymns can be advantageous. Now, I’d like to propose a few guidelines for including psalm-hymns in hymnals and in worship. Psalm paraphrases should never replace or supersede literal psalm settings. We already discussed how psalm-hymns can be useful in worship. But I would contend that each biblical psalm should have at least one complete, accurate setting in any psalter. An unfortunate shortcoming of the blue Psalter Hymnal, for instance, is with regard to Psalm 9. The only setting of this psalm (number 14, “Whole-Hearted Thanksgiving”) is a weak paraphrase, with much of the biblical content truncated and replaced with an extra-biblical refrain. There is nothing wrong with this selection as a psalm-hymn; it preserves the basic message of the text, and it’s certainly a rousing selection to sing at the opening of Sunday worship. No, in this case, and in many others like it, it’s what’s missing that’s the problem. We need solidly accurate settings in order to faithfully sing the psalms. Psalm paraphrases should not tamper with the original theme of the psalm. For instance, you may have sung a chorus based on Psalm 46:10—“Be still, and know that I am God.” Yes, this is always a comforting reminder, but without reading the rest of the psalm, you wouldn’t realize that this statement is spoken in the context of global turmoil at a catastrophic level! “Therefore we will not fear though the earth gives way, though the mountains be moved into the heart of the sea, though its waters roar and foam, though the mountains tremble at its swelling. Selah” (vv. 2, 3 ESV). Only when we read the entire text can we appreciate the true comfort that comes from resting in God. Many other instances like this exist. No, a psalm-hymn doesn’t necessarily have to include an entire psalm text, but it should at least provide the general context surrounding its content. Psalm-hymns are especially important when they incorporate the New Testament message into the Old Testament text. Many of the psalm paraphrases in the blue Psalter Hymnal accomplish this beautifully. Take, for example, numbers 83, 135, and 221 (from Psalms 45, 72, and 110, respectively). In all three of these cases, the original significance of the psalm is preserved, but Christ is made the central focus. This is an extremely helpful contribution to the practice of psalm-singing, as the candlelight of these Old Testament songs is flooded with the Light of the World—Christ himself. I hope these few comments have helped to make the distinction and purpose of psalm-hymns a little clearer. Perhaps it’s best to view psalm-hymns almost like we view hymns—as a supplement to psalm-singing, though never as a replacement. It’s my belief that as a body of believers, we should use the best resources at our disposal. So if we’re going to sing psalm paraphrases, as I believe we should, it is our duty to find the best possible selections, and sing them well and often. May God grant the Psalter Hymnal Committee insight to select such psalm-hymns for our new hymnbook, and may they be used for generations to come in the heartfelt worship of our God. Does your church tend to favor literal psalm settings or psalm paraphrases? What are some of the weaknesses of psalm-hymns, especially as regards the Scriptural content? What are some of the strengths of psalm-hymns, with regard to the versification, music, &c.? Have you noticed songs that take a portion of a psalm or other Scripture passage dramatically out of context? Should psalm paraphrases be found in the “psalm” section of the new Psalter Hymnal, or in the “hymn” section? Last week I brought to your attention the concept of the “psalm-hymn” and how it relates to current discussions about the new URC Psalter Hymnal. Since then, I’ve received a few comments in favor of psalm-hymns, and a few in favor of literal psalm settings. Honestly, I’m still on the fence myself regarding how to strike the proper balance between Scriptural accuracy and congregational edification. I think enough has been said about the merit of literal settings for now, though, so in this post, I’m going to briefly outline a few possible advantages of using psalm-hymns in worship. First, many psalm-hymns interpret the psalms in light of the New Testament, in a way that literal psalm settings cannot. For instance, in Psalter Hymnal number 135 (“Christ Shall Have Dominion”), Psalm 72 is understood to speak of Christ as the eternal King. While this exegesis is not found in the actual psalm, we cannot really say it is unbiblical, since this message is confirmed throughout the rest of Scripture. In fact, even Jesus often interpreted passages from the psalms to refer to himself (Psalms 110 and 118, for example). Similarly, the author of Hebrews not only quotes from the psalms extensively, but applies them to New Testament truth as well. Just as our ministers preach on Old Testament texts and interpret them through the lens of the whole gospel, so these psalm-hymns bring the songs of God’s people Israel into focus for the people of God’s new covenant. Second, in some cases, these psalm-hymns may actually be wiser choices for congregations than literal psalms. Yes, singing literal psalms is a commendable goal for Reformed churches that desire to improve the psalm-singing they have practiced for decades. But what about newer congregations that are emerging from more contemporary music styles? Mightn’t switching from gospel songs and praise choruses directly to complex literal psalm settings easily discourage such churches? The psalm-hymns in our songbook preserve the basic unaltered message of the Scripture, yet present it in an easy-to-learn hymn-like format. 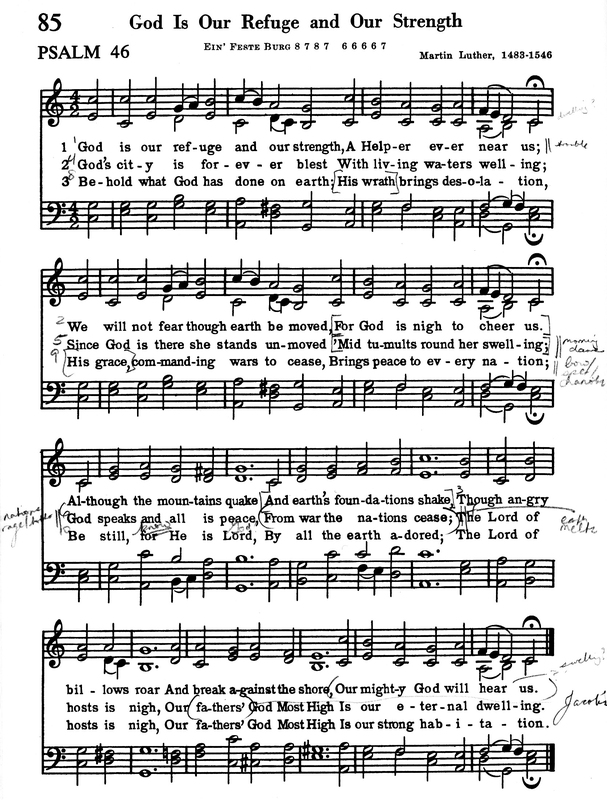 Many of the tunes used with these texts are from familiar songs like “When I Survey the Wondrous Cross” and “To God Be the Glory.” All this to say that, regardless of the excellent value of literal psalm settings, I believe psalm-hymns might be more practical for some congregations, and more helpful in learning to sing God’s Word—especially for the first time. Third, the paraphrase settings of the Psalter Hymnal have become very familiar to many URC congregations. Forsaking the old, well-known songs completely, even to incorporate newer and more accurate psalm settings, is hard to justify for these churches. Yes, all churches should be open to change, when change is necessary to worship God more faithfully! But is it helpful or hurtful to such congregations to remove familiar favorites just because they are psalm paraphrases rather than literal translations? And is it any coincidence that many of the most beloved psalm settings in the Psalter Hymnal—“Lord, our Lord, Thy Glorious Name,” “O Come, My Soul, Bless Thou the Lord,” “Hallelujah, Praise Jehovah”—are actually psalm-hymns? Time itself has shown that these songs resonate with worshipers across multiple generations, often in a way that literal psalm settings cannot. —than to memorize the literal ESV text: “When I look at your heavens, the work of your fingers, the moon and the stars, which you have set in place, what is man that you are mindful of him, and the son of man that you care for him?” (vv. 3, 4). The flow of the melody, the number of syllables, and the rhyme at the end of each line—all of these things give the reader clues about what to expect next. Sometimes literal psalm settings are able to accurately render the Scripture while still conforming to this rhymed-meter flow, but often these poetic elements become compromised in the effort to translate the psalm literally. Both kinds of psalm singing can be used as an aid to memory, but the method of memorization is quite different. In these few points I’ve simply tried to bring your attention to some of the benefits of psalm-hymns. All that I’ve written is just an amateur appraisal of singing the psalms from a fairly inexperienced onlooker. So, comments, questions, corrections, concerns—all are heartily welcome, as usual. I’d especially like to hear how you view psalm-hymns in your church, and whether you’ve noticed similar benefits in singing them. And next time, Lord willing, I’ll wrap up our discussion with a few practical ideas on the place of psalm-hymns in worship.